I ran Israel’s Atomic Energy Commission. I know the Iran deal is working. It’s hard to believe it, but it’s been a year since the United States and five other major powers signed an agreement with Iran to defang its nuclear program. At the time, Prime Minister Benjamin Netanyahu was making dire warnings that the agreement might confront Israel with the specter of a second Holocaust. He urged American Members of Congress to reject the agreement — casting it as a disaster for Israeli security. Yet while the PM made his opinions known loud and clear, many senior Israeli military and intelligence officers, nuclear experts and strategic analysts were quietly arguing that this was a good deal for Israel that would actually make us much safer. As one of these experts, I did not hesitate to speak out openly about my strong support for the agreement. As the former Director General of the Israeli Atomic Energy Commission, I was one of more than a dozen Israeli security and nuclear experts who, with J Street’s help, came to the United States to make this case directly to US lawmakers. Thanks in part to our efforts — your efforts and mine — we succeeded in defeating those who tried to undermine diplomacy and kill the agreement. Since the deal was signed, Iran has reduced its stockpile of low-enriched uranium by 98 percent — leaving them with an amount far below what is needed to build even one bomb. They have dismantled 12,000 centrifuges, blocking their capacity to enrich uranium. They have agreed to an increased presence of IAEA inspectors on the ground, the installation of the most modern monitoring equipment and unprecedented surveillance of the entire uranium and centrifuge supply chains. Finally, they have removed and disabled the core of the plutonium reactor they had almost finished constructing in Arak and filled it in with cement. Simply put, every single one of their pathways to a nuclear weapon has been blocked. The deal has been a major success. 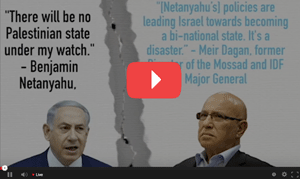 Don’t just take my word for it — listen to what other senior Israeli security leaders have to say. Lieutenant General Moshe Ya’alon, Israel’s Defense Minister until quite recently, made clear last month that Israel does not face an existential threat from Iran. These colleagues of mine know what they’re talking about. For decades they were responsible for Israel’s security. We all know that this agreement wasn’t perfect — no agreement could be. Iran remains a threat to Israel and to the region — and the deal, focused on stopping Iran’s nuclear program, could not also address its support for terror. We felt that our top priority had to be ensuring that a malign actor like Iran cannot gain access to nuclear weapons. Now, thanks to the incredible monitoring and verification work of IAEA inspectors, this deal ensures that Iran cannot gain access to the bomb. It gives us — Israelis and Americans — time, and incredible insight and access into what Iran is and isn’t doing. It has disrupted and dramatically rolled back a nuclear program that was extensive and accelerating, and instead given us space to develop new defensive systems against any future threats. And it’s accomplished all that without the need for a dangerous and disastrous war — without needing to put Israeli soldiers and civilians in harm’s way. After a year, the truth is plain. With all due respect to Prime Minister Netanyahu, he was flat out wrong — and my colleagues and I were right. This was and remains a good agreement. It’s made Israel and the world safer. For that, I know that all of us are thankful. If you haven’t had a chance to read Amir Tibon’s groundbreaking article Netanyahu vs. The Generals, we’ve created a video with some of the most important quotes from the piece.